Recently I was contracted by the great folks at 360incentives to create their 2013 Holiday e-card. It had to be quick, it had to be lean and mean - and it had to be different. I set to work sketching, drawing, referencing, pondering and noodling - to no avail. Then I smartened up and "shut off" so I could just think. It's amazing, all I need to do is turn my head ever slightly to the left or right - and I've me some serious inspiration... yet I need to keep reminding myself of this. I make a lot of stuff in PhotoShop and Illustrator. I make even more stuff with pastels and paint that never sees a client's office - which is another story all together, but for some reason it hadn't dawned on me to take the non-computer creative side and get busy. On go the boots... and considering it was 22 below, on went the hand warmers. 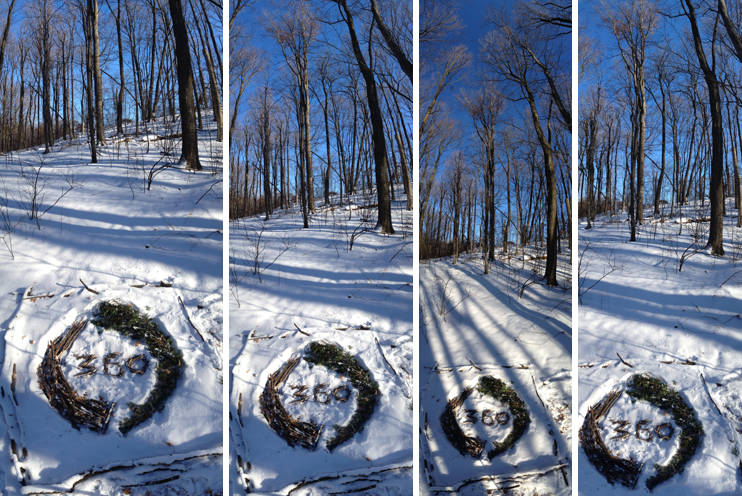 I found a patch of snow and had myself an idea. I'm a fan of Andy Goldsworthy, a sculptor who would build things in nature with found objects, photographs them and then carries on, leaving the work he's completed to carry out its natural course - and some inspiration set in. 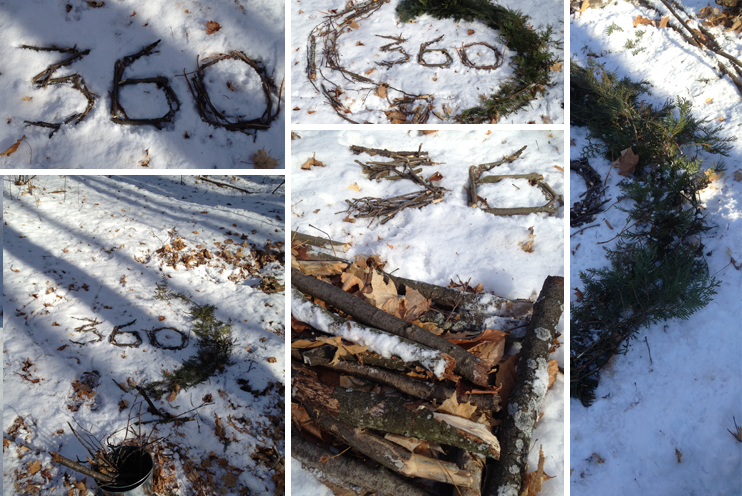 The concept in my noggin was pretty simple, I'd take the 360incentives logo; a set of numbers and some swooshery, and make it in the snow with found items. Their logo is a simple mix of blue and green - so I figured I'd get some cedar branches to emulate the green elements, and sticks with leaves to knock out the blue - after all, there's nothing blue in nature this time of year. Simple approach - after drawing a rough line in the snow, I grabbed a bucket and started assembling my materials. The process was a lot of fun. 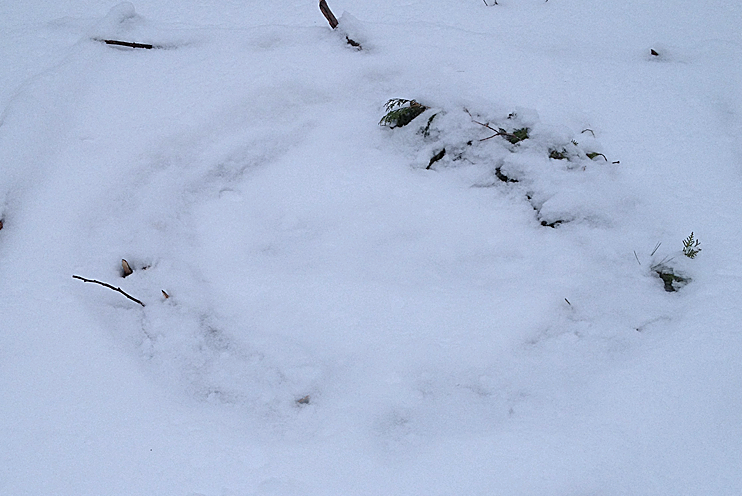 Sorted out with my hot-paws and a Thermos of coffee, I took my collection of sticks, needles, branches and assorted fallen limbs - and let the hour pass shaping the logo in the snowy woods. I'd missed the morning sun by the time I finished this - and the shadows cast from the west were long and dark across the final logo. Past that however - I'd destroyed the snow around the work area... and it was only a light dusting on the forest floor, so every handful I picked up for "touch-ups" was full of leaves and made it all the worse for wear. Out came the wheel barrow, and I spent a solid 20 minutes back at the cabin, collecting every flake I could from a roofline, so I could try and clean the area up around the piece. I snapped a few dozen shots... But as I said, the shadows were long, and the ground - my canvas - despite my tricky attempts with the wheelbarrow, was ravaged. But ol' Lady Nature had herself some other plans. A healthy 3 inches of snow, but I wasn't dismayed - I tried sweeping off the fresh powder with my hands - and made a mess. Next up, a straw broom... failure. I couldn't sweep the piece - and looked through the photos I had already taken. But unconvinced with the state they were in, I came up with the idea of blowing the snow off gently... like a paleontologist would spray a light dusting of air across some fragile bones. Yes, I totally made that comparison. So here I am, in the middle of the woods at 8 in the morning, with a genius idea that only meant I had to unplug all of the Christmas lights on the house to steal their collective extension cords for power. 45 minutes later or so, I'd salvaged the majority of the piece, and really found I dug the depth created by the removal of snow with the output portal of the ShopVac. There was a bit of damage to the logo itself, but with a few more sticks and greens, I had it back up to speed - and the bonus here; the morning sun was still on my side... I just had to wait for it to creep around the east bank of maples. So fresh fallen snow, a rebuilt logo - and I was a much happier camper. But I couldn't capture what I was seeing with my feet alone. I needed to get to a taller vantage point - and I'd like to thank the good graces of chance, that there was no one tromping through the woods that day hunting grouse - cos I looked quite the fool, teetering on a ladder with a ShopVac by my side, trying to get an aerial view of a stick pile. So cool - I had my vantage point - I had my clean snow - I had my sunlight... But I'm a fickle fella, and I still wasn't digging the end result. Big logo in the snow - but so what? I needed to try and capture the environment I was in - give it some reference and perspective - really deliver the impact I was seeing. I'm limited in photography gear, but what I do have handy at any given time is the brain trust of some fine folks from Cupertino... and a couple versions back, they managed to implement a smart feature that allowed me to talk panorama pic's for no good reason. Except now I had a good reason, and it was exactly what I was looking for. The only thing I needed to do, was play with the various shadows the sun cast as it moved through the woods - and every 20 minutes or so, I jumped out of the studio and snapped a few more shots. And there we go - a simple idea that let me have an "Art Attack". Next steps meant I played in the warmth; cleaning up the snow a bit in PhotoShop from my twig-snapping spree, and tightening the overall piece to find the balance between deciphering the logo itself, and capturing the environment. A couple more hours, application of various elements to give it an even snowier appeal - and I was able to bring this piece to fruition... I'm pretty pleased with it too. Plus - eyes opened to realizing there's a lot more nature I need to start bringing into my work. I get paid these days to have fun - and this was a blast. I'd hashtag it awesometown if I was so inclined.